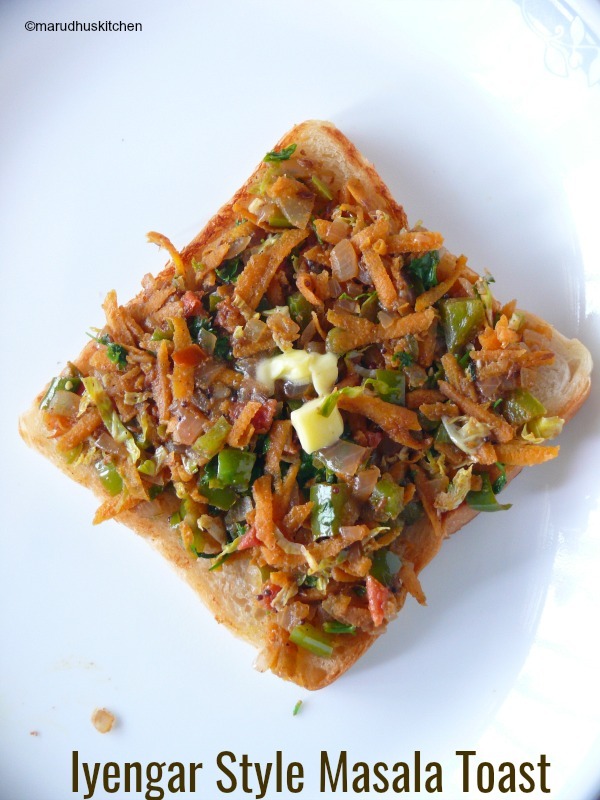 These Iyengar bakery style masala toast were my favourite after college snacks to munch on regularly those days.The very speciality of the original iyengar bakery is that it is prepared and baked fresh every day. The aroma from these iyengar bakery biscuits and breads are so special and mesmerizing.That taste of this bread masala sandwich recipe lingers in my mouth even now. It’s not at all a tough recipe to try at our home. Despite the fact that it’s filled with vegetables our children will definitely like it.In a way it becomes an excellent healthy after school snacks for children.Majority of us are addicted to the Iyengar bakery style varieties like benne biscuit ,salt biscuits and honey cake to list a few. 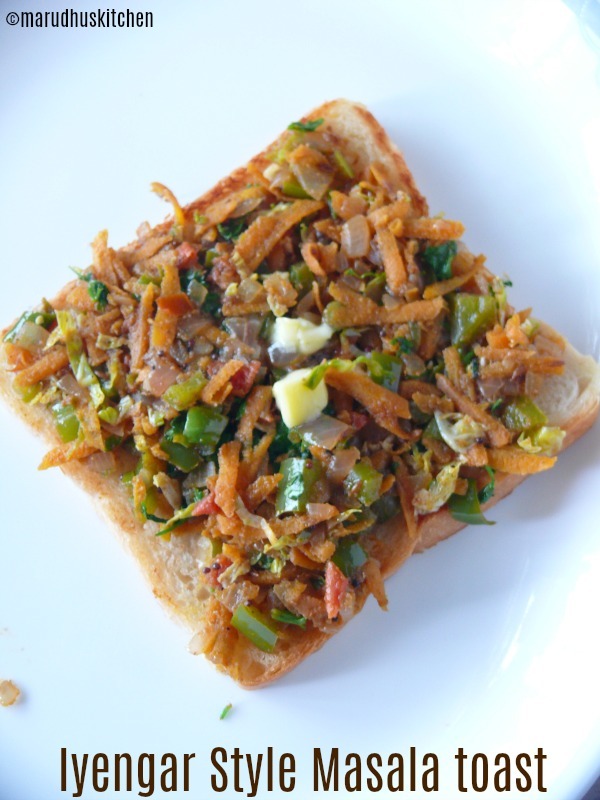 Even Kara bun is very famous and I wish to make it at home very soon .If not sandwich bread you can use wheat bread for this bread masala sandwich recipe.Its a open sandwich recipe with lots of vegetable going in. 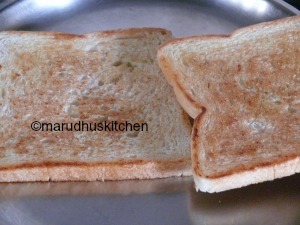 Do try this simple toast and you will surely like it. 1.Keep every ingredient ready,start by heating oil in a kadai,add mustard to splutter. 2.Then add cumin,immediately add onions with green chillies to become translucent. 3.Add chopped capsicum and tomatoes. 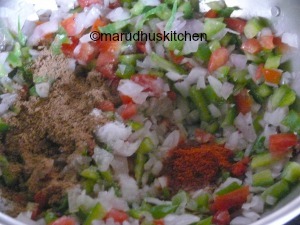 4.Add garam masala and chilli powder with needed salt for the whole masala. 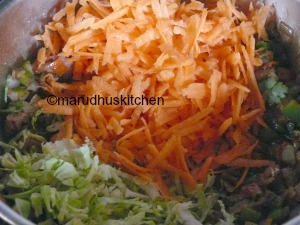 5.Saute for few seconds till rawness goes off,then add grated carrot and shredded cabbage. 6.Keep the flame in low and let it be for 2-3 minutes,with in-between stirring. 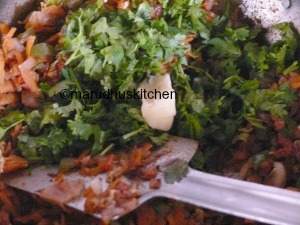 7.Now keep the flame high stir for few seconds add chopped coriander and switch off,finely add a dollop of butter. 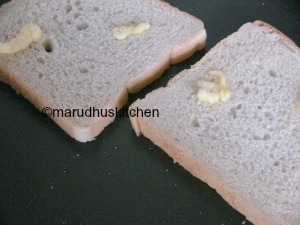 8.Toast the bread in a hot tava by adding butter till it is nicely golden. 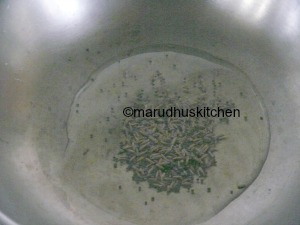 9.Now spread sufficient masala to each bread and serve hot. Keep every ingredient ready,start by heating oil in a kadai,add mustard to splutter. Then add cumin,immediately add onions with green chillies to become translucent. Add chopped capsicum and tomatoes. Add garam masala and chilli powder with needed salt for the whole masala. Saute for few seconds till rawness goes off,then add grated carrot and shredded cabbage. Keep the flame in low and let it be for 2-3 minutes,with in-between stirring. Now keep the flame high stir for few seconds add chopped coriander and switch off,finely add a dollop of butter. Toast the bread in a hot tava by adding butter till it is nicely golden. 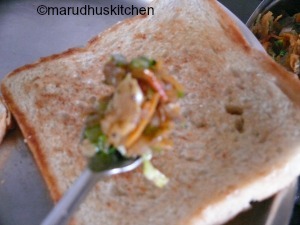 Now spread sufficient masala to each bread and serve hot. You can use brown bread or even multi grain bread. Don’t cook the vegetable too much each one should maintain their crunch and colour. I opt butter to add more flavour,you can use even ghee instead. Arnold Country Bread as Low as $0.39 as ShopRite!